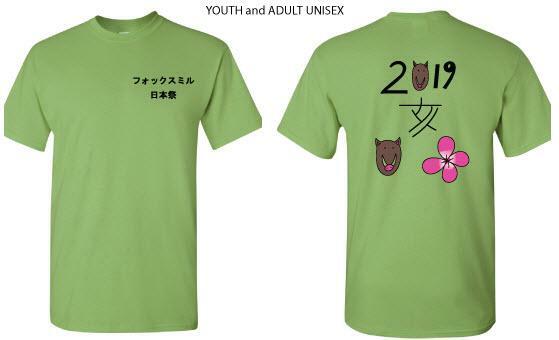 The Japanese Festival (Matsuri) “Year of the Boar” t-shirt is available for sale online at https://orderschoolstuff.com/foxmill/. Congratulations to 2nd Grader Tatum Gammon for submitting the winning design! Online ordering ends on Wednesday, April 3. No late orders will be accepted, and no additional t-shirts will be printed. All sales are final. All orders will be distributed via the Thursday packets at school on May 2. The back of the shirt has two boars, a flower, the kanji character for boar, and the year. The front of the shirt says “Fox Mill Matsuri” in Japanese. Sample shirts are available in the school office to check the size. A 100% pre-shrunk cotton athletic cut shirt in youth and unisex sizes. The price is $9 for sizes youth small to adult extra large and $11 for adult 2XL and adult 3XL. A 100% pre-shrunk cotton, softstyle ladies cut shirt. The price is $11 for ladies small to ladies extra large, and $13 for ladies 2XL and ladies 3XL. Questions? E-mail Amy at wooster92@yahoo.com.